Little House In Colorado: Community Garden Project - It's A Go! I'm doing a happy dance here! I got the "Okay" to move forward with the community garden! It's a good thing, too because I've already purchased a ton of seeds and plan to winter sow a bunch of them (mainly the tomatoes). I got this batch from Botanical Interests, which is a Colorado company. I made sure to get extra cilantro because my "grandchild" (The Girl's guinea pig) LOVES cilantro. I've never grown kale so that's a new one for me. 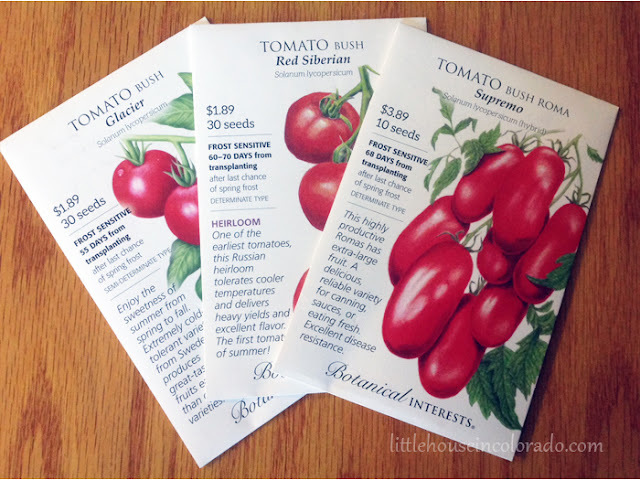 I had great luck with the tomato seeds I got from Botanical Interests last year, probably because they were short-season tomatoes...perfect for my growing season. I'll be planting those again this year, just more of them! 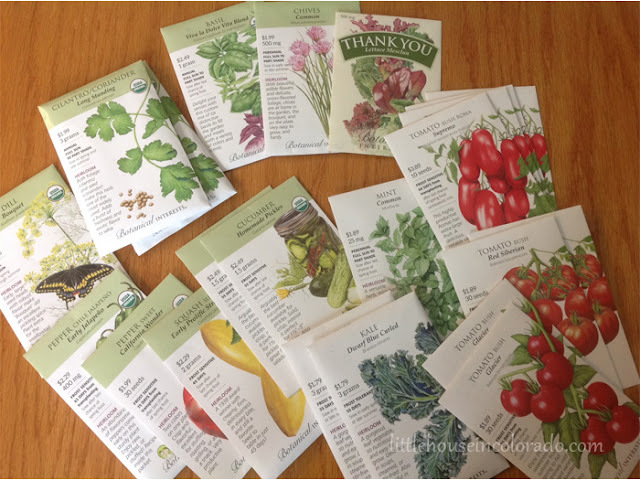 I won't be planting all of these veggies for myself. There isn't enough space, even if I use a large plot in the community garden. What I hope to do is hold a neighborhood "plant sale" in the spring and sell off a bunch of these plants to raise money for improvements to the garden. Interest in the garden has really been growing just in the last several weeks. Several neighbors have pulled me aside just to tell me how excited they are about it. I also have a boy scout interested in doing a bunch of the renovations as an Eagle Scout project. We'll still need documents and contracts for plot rentals drawn up so they can be approved before planting season. So while the snow falls outside, I'll work on paperwork and continue to plan the garden renovations.